The BLVD Market is an opportunity for the community to gather and enjoy an offering of fresh produce and unique items in an open market atmosphere. The Market’s fall and winter hours are 3 – 7 p.m., every Thursday (excluding Thanksgiving day, November 22) on Lancaster Blvd., between Ehrlich Avenue and Fern Avenue. This area will be closed to traffic and parking from 1 – 11 p.m. on Market days. Westbound and Eastbound Avenue K lane closures between 27th Street West and 40th Street West due to Public Works Construction Project, to repair sidewalks as well as curbs and gutters. The Lancaster Chamber of Commerce’s annual Christmas Parade will make its way through downtown Lancaster on December 1 beginning at 10 a.m. Lancaster Blvd. 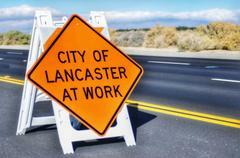 will be closed from 15th Street West to Division Street, from 6 a.m. – 2 p.m.
Beginning at 2 p.m., Lancaster Blvd. will closed from Fern Avenue to Date Ave. for the Block Party of the Decade. This free community Block party will run from 5 p.m. – 8 p.m., with Lancaster Blvd. reopening for traffic at 12 a.m. Sunday, December 2. The City of Lancaster will bring holiday cheer to The BLVD with A Magical BLVD Christmas from 5 – 9 p.m. As such, from 6 a.m., December 8 – 12 a.m., December 9 Lancaster Blvd. will be closed between Genoa Avenue and Beech Avenue. This closure will include North and South alleys parallel to Lancaster Blvd. From 9 a.m. – 12:30 p.m. Jackman Street will be closed from 10th Street West to Sacred Heart Catholic Church for the parish’s Our Lady of Guadalupe Procession.